Fantastic. 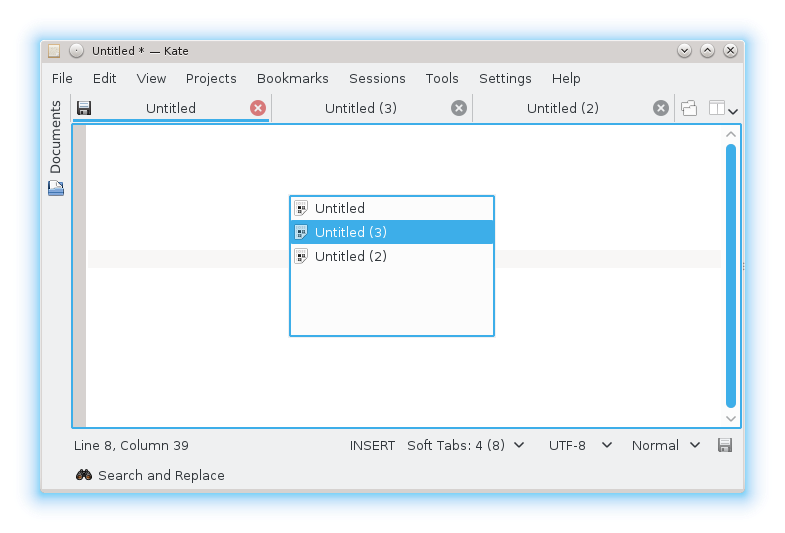 I never realized that ctrl+tab was an available feature – I really like the new twist with functioning like alt-tab jumping through recent rather than just presenting a list. One thing that I thought about when looking at above screenshot is why there is a “Search and Replace” button that takes up a full line of text – especially with the toolbar now being hidden by default. Matching the other decision, then it should be hidden. Then I realized that this is a different Search and Replace than the “Replace” in the menu – this is called “Search in files” in the menu (freely translated from danish). I think that these tools should be relabeled to improve consistency. Probably ending up with something like “Find”, “Find and Replace” and “Find and Replace in Files”. Also the “Search and Replace” panel is closed differently than the Find and Find and replace. Silent reload sounds like a nice feature.